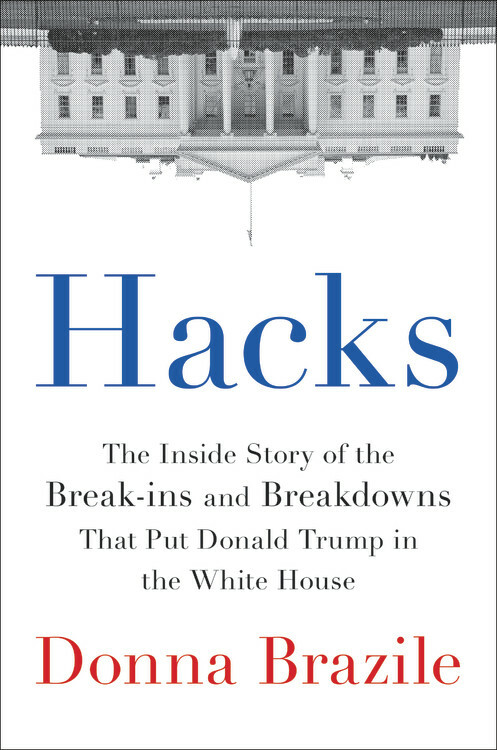 Skimming through Donna Brazile’s book Hacks: The Inside Story of the Break-ins and Breakdowns That Put Donald Trump in the White House, I have so far found just a couple excerpts worth quoting to shed more light on the story. I previously discussed the initial media reports about the book here, and have follow up information information here. The second post includes information debunking false claims made by Clinton supporters. Yet the states kept less than half of 1 percent of the $82 million they had amassed from the extravagant fund-raisers Hillary’s campaign was holding, just as Gary had described to me when he and I talked in August. When the Politico story described this arrangement as “essentially… money laundering” for the Clinton campaign, Hillary’s people were outraged at being accused of doing something shady. Bernie’s people were angry for their own reasons, saying this was part of a calculated strategy to throw the nomination to Hillary. The other campaigns—Martin O’Malley and Bernie—also signed victory fund agreements that kicked in should they secure the nomination, not seven months before. They also did not specify as much immediate control from the campaign as the one Hillary signed with the DNC. There is no doubt that it was unethical. It remains to be seen whether this attempt to evade federal campaign finance laws was legal. As I noted in the previous post, Donna Brazile has been trying to walk back her accusations that the nomination was rigged, but while doing so said that the Clinton campaign was a cult. “Morning Joe” host Joe Scarborough said during Brazile’s appearance on the MSNBC show on Wednesday that he thinks President Trump won the 2016 election because of mistakes the Clinton campaign made, former FBI director James Comey and the influence of Russia. “I’ll put it all in there, but it should have never been a close race,” he said. Brazile has also been trying to walk back her previous description of the nomination battle between Clinton and Sanders as rigged, despite the evidence from Wikileaks, the class action suit against the DNC, the multiple rules used by the DNC to tilt the results, a previous confession from Tom Perez that it was rigged, and the evidence presented in her own book. 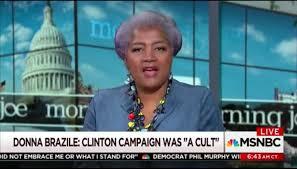 Most likely by later this week Brazile will try to walk back her statement that the Clinton campaign was a cult, perhaps saying it was a religion instead. In other news coming out about her book, The Washington Examiner reports that Brazile felt betrayed by Jake Tapper for criticism of her for providing debate questions to Hillary Clinton. While I remain grateful to Brazile for the information she did divulge which added to the massive amount of evidence that the nomination was rigged, she is certainly not presenting herself as a person of principle. Yesterday was a good day for Democrats, including many progressives. Democrats desperately needed this win and should be happy about the anti-Trump backlash in yesterday’s elections, but also should realize that it would have been an anti-Democratic backlash instead if Clinton was in the White House. Having Donald Trump in the White House, and not having Hillary Clinton on the ballot, made a huge difference for Democrats compared to a year ago. Hopefully Democrats won’t take yesterday’s results to mean more than it really does and ignore how unpopular the party actually is, only polling slightly better than the Republicans. A year ago, Bernie Sanders ran an insurgent campaign that helped popularize democratic socialism and resurgent populism among American progressives. On Tuesday, populist candidates won in places you may not expect — from Manassas, Virginia to Knoxville, Tennessee. In Virginia, Democratic Socialists of America-backed Lee Carter defeated the GOP whip Jackson Miller in the House of Delegates. Richmond-Times Dispatch reporter Patrick Wilson noted that the state Democratic Party offered little support to Carter. He won anyway. Numerous wings of the broader party united behind Carter, including factions, such as Planned Parenthood, who had backed Hillary Clinton last year. Across the country, DSA candidates took offices, winning both as Democrats and independents. Socialist Seema Singh Perez won a seat on the Knoxville City Council. In Pittsburgh, a pair of DSA-backed candidates won, including Mik Pappas, an independent candidate who defeated a 24-year incumbent Democrat to become the 31st Magisterial District judge. Pappas ran strong on criminal justice reform, focusing on restorative justice rather than punitive measures. In Somerville, Massachusetts, DSA members JT Scott and Ben Ewen-Campen unseated long-time incumbents to join the Board of Aldermen. DSA member Charles Decker will represent Ward 9 in New Haven, Connecticut. And in Philadelphia, District Attorney Larry Krasner — also backed by DSA — will soon take office promising to radically overhaul the city’s criminal justice system. Huffington Post has more information on some of the winners. The Democrats have a narrow path to retaking the House next year. A backlash towards Trump can only go so far, and the Democrats’ lead in the generic polls hardly guarantees victory. In order to achieve more than a dead cat bounce the Democrats will need to do more than be the lesser evil party. They will have to give voters a reason to support them beyond opposing Republicans. 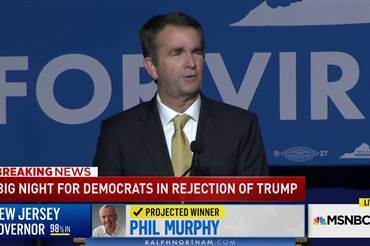 Hopefully they will learn from last night’s results that running Republican-lite candidates such as in 2010, 2014, and 2016 was not a good strategy.